Cardiomyopathy is a disease of the heart’s muscular wall, called the myocardium. It causes enough damage – thickening or thinning, enlarging and stiffening the wall – that the heart no longer pumps blood effectively. An estimated 1 in 500 adults may have cardiomyopathy, according to the Centers for Disease Control and Prevention. This progressive disease might show no symptoms in children and young adults, heightening the risk of sudden cardiac death. 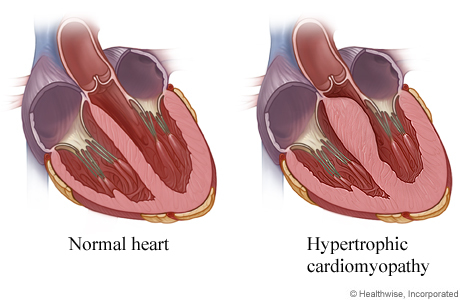 Sometimes cardiomyopathy is not evident until progressive weakening leads to heart failure. Shortness of breath or difficulty breathing during physical activity. Swelling in the feet, ankles, legs, abdomen and veins in the neck. Determining the source of cardiomyopathy can be difficult. Sometimes it’s a viral infection or a byproduct of another disease (or treatment). Sometimes it’s inherited. And sometimes it’s unknown. 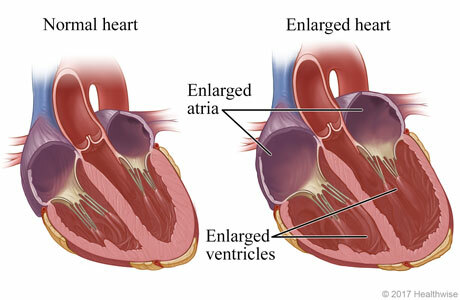 An enlarged and stretched ventricle (pumping chamber), more common in males and the most common type affecting children. Alcohol (accentuated if combined with poor nutrition). Complications in the final stages of pregnancy. Exposure to certain toxins (poisons, heavy metals). Thickened heart muscle, affecting how the heart fills with blood or how it distributes blood to the body. This condition can cause sudden death in adolescents and young adult athletes. It’s frequently inherited. Researchers have concluded it is inherited. When the heart muscle becomes stiff or scarred, it becomes harder for the lower chambers of the ventricle to accumulate blood between heartbeats. Protein buildup in heart muscle. Excess iron in the heart. If you’re diagnosed with cardiomyopathy but have no symptoms, your doctor might decide treatment is not necessary. Lifestyle changes, however, can help control whatever is causing your type of cardiomyopathy. ACE inhibitors, beta blockers: Examples of drugs that lower your blood pressure. Anticoagulants, blood thinners: Prevent blood clots. Antiarrhythmics: Prevent abnormal heart rhythms called arrhythmias. Corticosteroids: One of the drugs that reduces inflammation. Diuretics: Water pills that eliminate the body’s excess sodium. Electrolytes: Electrically-charged minerals that regulate fluid levels, blood chemistry and other processes. Sodium, potassium, chlorine, calcium, magnesium and phosphate examples of electrolytes. Aldosterone blockers also can be used to balance electrolytes. CRT (cardiac resynchronization therapy) device: Regulates contractions between the left and right ventricles. LVAD (left ventricular assist device): Assists the heart’s pumping action. ICD (implantable cardioverter defibrillator): Uses electrical shock to the heart to control potentially fatal arrhythmias that can cause sudden cardiac arrest. Pacemaker: Electrical pulses from a device placed near the chest or abdomen that control arrhythmias. 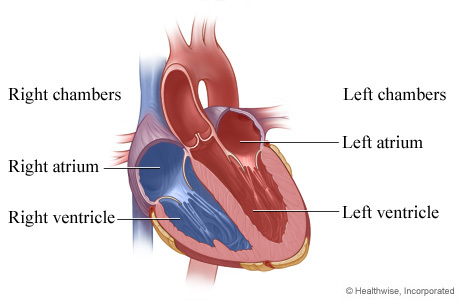 Open-heart surgery, usually for younger patients with hypertrophic cardiomyopathy, that removes part of a thickened, overgrown septum protruding into the left ventricle. The removal improves blood flow and reduces mitral regurgitation. During the procedure, the surgeon also can repair or replace the mitral valve. Alcohol septal ablation, introduced as alternative to septal myectomy, reduces thickened tissue to normal size with alcohol (specifically, ethanol) injected through a tube into the small artery that delivers blood to the thickened heart muscle. The procedure provides relief when normal blood flows through the ventricle is restored.